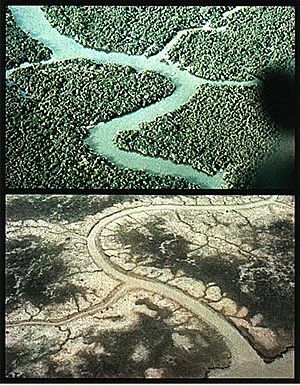 Mangrove forests, like the top one east of Saigon, were often destroyed by herbicides. it may have caused health problems in soldiers and civilians. It is a defoliant that destroys forests. It was used by the United States military so their enemies had no place to hide. The problem with Agent Orange is that when it is released, some dioxins are also generated. Dioxins stay a long time in the environment. They are very toxic, and cause genetic modifications and cancer. Up to 4 million people in Vietnam were exposed to the defoliant, with around 1 million now suffering serious health issues. The chemical is capable of damaging genes, resulting in deformities among offspring of exposed victims. The U.S. government has documented higher cases of leukemia, Hodgkin's lymphoma, as well as other various kinds of cancer in exposed veterans. Agent Orange also caused enormous environmental damage in Vietnam. Over 3,100,000 hectares (31,000 km2 or 11,969 mi2) of forest were defoliated. Defoliants eroded tree cover and seedling forest stock, making reforestation difficult in numerous areas. Animal species diversity sharply reduced in contrast with unsprayed areas. The aftermath of the use of Agent Orange in Vietnam resulted in massive legal consequences. The United Nations ratified United Nations General Assembly Resolution 31/72 and the Environmental Modification Convention. Lawsuits filed on behalf of veterans as well as Vietnamese veterans sought compensation for damages. Agent Orange was to a lesser extent used outside Vietnam. Some countries, such as Canada, saw testing, while other countries, such as Brazil, used the herbicide to clear out sections of land for agriculture. Land in Laos and Cambodia was sprayed with Agent Orange because forests on the border with Vietnam were used by the Vietcong. British General Sir Gerald Templer authorized the use of 2,4,5-T and 2,4-D (Agent Orange) throughout the Malayan Emergency to destroy bushes, trees, and vegetation in order to deprive the insurgents of cover. 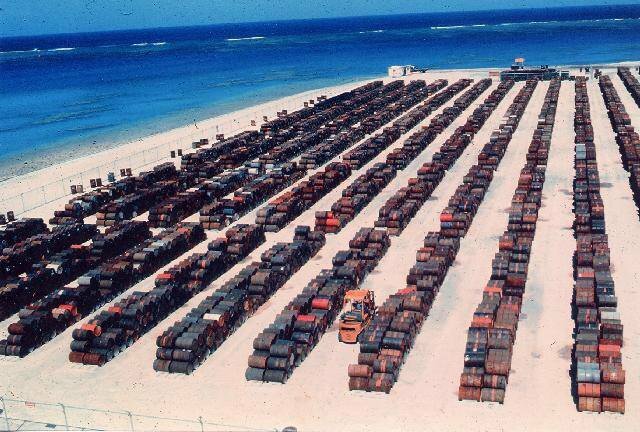 Stacks of 55-gallon (200 L) drums containing Agent Orange. Agent Orange Facts for Kids. Kiddle Encyclopedia.